Al Shahania Stud in Qatar has long had a reputation for being home to superstar colts, with the multiple champion Barzan Al Shahania (Stival x NW Siena Psyche) being a case in point. Their latest star is the impressive two-year-old bay, Na’Mous Al Shahania, and he will be taking to the Scottsdale show-ring at the end of this month. Na’Mous Al Shahania is sired by the great stallion FA El Shawan, who was taken from the world far too soon, passing away suddenly in 2013 when just six years of age. 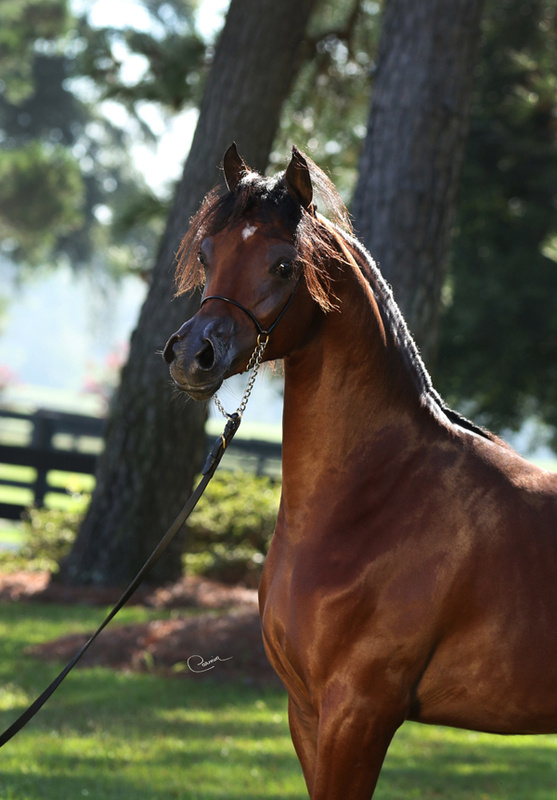 Purchased as a yearling and exported to Brazil, FA El Shawan was named Brazilian National Champion and would later be named US National Champion Six-to-seven Years. At the Arabian Breeders’ World Cup in Las Vegas, FA El Shawan earned the highest score in the show’s history to date, back in 2011. FA El Shawan was sired by Marwan Al Shaqab (Gazal Al Shaqab x Little Liza Fame by Fame VF) and out of the ZT Shakfantasy (El Shaklan x Selket Mirror by Furno Khamal) daughter, Foxbriar Shakita (ex Selket Mirror by Furno Khamal), making him a perfect blend of Egyptian, Spanish, Polish and Russian bloodlines. Na’Mous Al Shahania’s dam is the beautiful Virtuosa MLR, a daughter of the late, great Versace (Fame VF x Precious as Gold by El Shaklan), making this exceptional young colt a full brother to the famed stallion FA El Rasheem. Virtuosa MLR is out of Alishamaal, a mare of the much admired Egyptian/Polish cross. Her sire in turn was Ali Jamaal (Ruminaja Ali x Heritage Memory by El Magato) while her dam was NV Alieshah, a daughter of Bey Shah (Bey El Bay x Star of Ofir by Bask) and out of Aandraya (Mystr-Rigo x Fixaaya by Mystr Fix). As FA El Rasheem has already proved, this combination of sire and dam is a potent one, and Na’Mous Al Shahania is already living up to expectation. HH Sheikh Mohammed Bin Khalifa Al Thani, owner of Al Shahania Stud, recognised that a colt of this pedigree would be the perfect cross of the stud’s Barzan Al Shahania daughters, and Na’Mous Al Shahania was purchased while just a foal from his breeder, Marlene Rieder, who also bred FA El Shawan and FA El Rasheem. 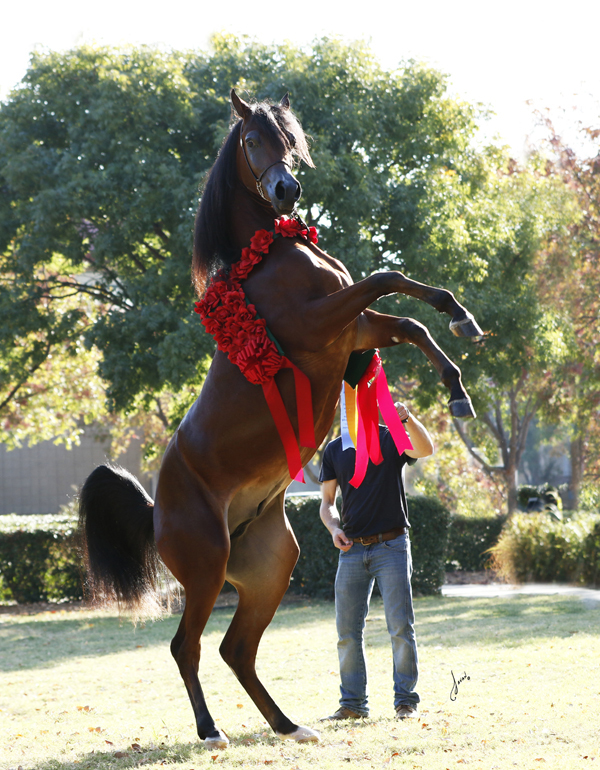 An enchanting bay, Na’Mous Al Shahania has a huge eye and wonderful expression, great length of neck, eye-catching Arabian type, and he oozes personality. With US trainer Ted Carson, Na’Mous Al Shahania went to the ultra-competitive US Nationals in Tulsa last October. There, he was named US National Champion Yearling Colt in illustrious company. Now, Na’Mous Al Shahania has his sights set on the show-rings of Scottsdale, Arizona, and there he will be vying for the one of the most hotly-contested titles in the United States. From there, Las Vegas in April will surely beckon and, like his sire before him, Na’Mous Al Shahania is sure to set the arena alight. Everyone involved with this stylish colt believes that this he has the ability to go all the way to the top, and certainly Na’Mous Al Shahania has the potential needed to make him one of the world’s leading colts. All eyes will be upon Na’Mous Al Shahania when he takes to the ring in Scottsdale this month, and with his impressive looks and proven pedigree, this is a horse that we can all look forward to seeing a whole lot more of over the coming months and years.